It's done. RPM 2011: "The Ghost Town". 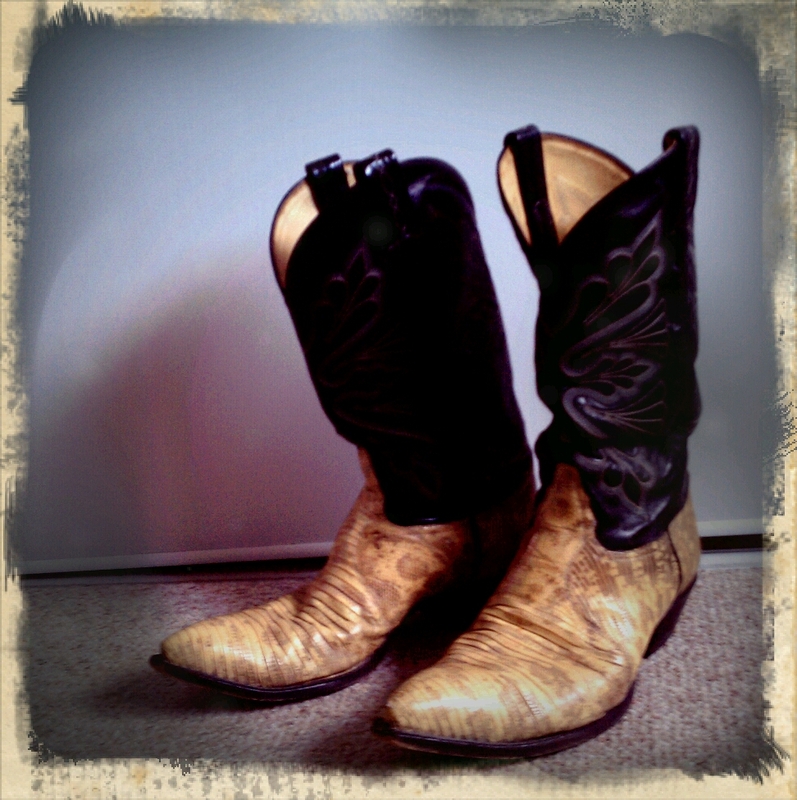 That's not the cover image, that's a picture of my cowboy boots, used for my "method recording" technique. CD mailed off to RPM Challenge today at lunch. As per usual, there will likely be some minor tweaks to mixes and mastering, but the record is, for all intents and purposes, done. I will have an "official" release once I have cover art. My 2010 album "Reflection" will also be officially released soon, as the cover art for that is taking a bit longer than planned - but it is so totally worth the wait! Great to have a holiday. Slow start with houseguests, but I did get to work at last. Worked on finishing up tracks that were close, and started the heavy work on "The Empty Sky". After the gym I made final tweaks. "The Crossing", "The Ghost Town", "Tumbleweed", and "For the Love of Mary Lee" are all in the can. That leaves "The Empty Sky" and "What The Wire Said". "Empty Sky" needs some major work. I really like it (even if no one else did!) but I have to polish it up, and that means throwing out nearly all the recorded tracks. I got pretty far on it today. "What The Wire Said" needs vocals and a bit of structural tightening. I can probably get that done tomorrow. I fly back from New York, the return trip taking almost double the time the outbound leg did. I get home after midnight, my body tired and on the verge of being sick. I spend the day working at home, and the evening doing some touch-ups on the existing mixes. I spent the morning working on "What The Wire Said", redoing the vocals, adding effects and a few percussion parts, and editing and tightening. I spend the afternoon struggling with a new track, which will be called "Interstate Wasteland". I sketch out a bit, laying down a beat, some chords, and writing far too many lyrics. After my usual slow Sunday, I went down to the studio and started working on "Interstate Wasteland". I quickly edited the lyrics down to just 3 verses and changed the chord progression to allow for a nicer melody. I had to do a bunch of vocal experiments before I got a take I liked. I had a few brief flashes of panic - was this totally awful? - but I powered through, adding some nice guitar parts and a few simple production touches. I reached a point where I couldn't think of anything else to do - I was noodling on guitar, noodling on keyboards. Clearly the song was finished. Well, maybe after some backing vocals. Touched up the mixes for "Empty Sky" and "Tumbleweed" and went to the gym for a quick workout and to listen. Sounds pretty good. Some final touches, and "Interstate Wasteland" is probably finished. I render out WAVs, install WaveLab 7 demo, and build a potential master CD. Tomorrow, final touches and mailing off! Today was Valentine's Day. My lovely wife is far more important than my RPM Project. I spent my free time with her. Tonight I quickly assembled the foundation of a new song - "Tumbleweed". Clip-clop trip-hop at its finest. Needs vocals and a bunch of other fixes. But the basics are there. Have a rough melody in place. As always, wondering if the melody is any good. Extended "Tumbleweed" out to nearly final length, though it's still missing a few important sections. I laid down some vocals with rough lyrics and put a few harmonies down. Sounding pretty good. Sort of like Cowboy Shriekback rolling through Las Vegas in Massive Attack's muscle car. I need to re-do the guitars, finish the lyrics, and maybe write a bridge and riff. Looking like this record might have fewer songs than previous ones, but they'll likely be longer songs. That's not so bad. "Meddle" by Pink Floyd is that way. Stayed up late working on "Tumbleweed". Got Tumbleweed to correct length, including adding a longer 2nd verse and some other adjustments. I finished writing the words but it was too late to lay them down. Today I laid in more vocals for "Tumbleweed", adjusted the mix, and added a Spanish-sounding guitar solo to the bridge, and some more twang to the outro. Fixed some problems with the bass, too. It's not bad. Sounds very clip-clop trip-hop! First day of a three-day weekend, and a lot to do, as this is the penultimate weekend and I have to travel next week. I had a bunch of clean-up to do on some of the other songs, but I wanted to get some new things down first - clean-up is good to save for short bursts and/or when you aren't feeling too inspired. Sometimes creativity and songs just do what they want to do. I had intended to work on a faster new song, but "For the Love of Mary Lee" just wouldn't leave me alone. I spent the morning working up some flamenco-style rhythms, studying Spanish guitar YouTube videos, and by mid-day had started to pull together a nice 6/8 feel for the track, complete with handclaps. When the Muse pulls you in a particular direction, it's best just to follow - the guitar parts came effortlessly (well, the writing - I am still a terrible acoustic player) and sounded very nice. Melody was going to be a bit of a problem, as my original draft of "Mary Lee" was in a different key and major. I worked on it, wrote the lyrics, had something that would probably work overall. My voice was pretty tired, and I'm not sure I like singing in the higher register for this one. So much of the rest of the record is in the low-voice/Johnny Cash vein, and the higher voice seems a little too "Broadway". I intended for this song to be one of those fado-ish extremely "emotional" types of songs, and I wanted it to be like "El Paso" and "The Streets of Laredo" in terms of its melody, content, etc. and those are on the pretty side as well. I just think it sounds weird right now. Tomorrow I'll probably take a whack at vocals in the low octave. Might be too low. I dunno. Maybe I'm over-thinking it. Like the last few records, at this point I worry the latest song isn't as "good" as the other songs already completed for the project. Sometimes, when you think you've gone the wrong way creatively, the right answer is not to go back, but to go farther in the "wrong" direction. I tried redoing the vocals in a low octave. No dice. And the chorus already sounded good. So I redid all the vocals in the original octave, and worked until I had a nice solid performance. I added some handclaps, more guitars, and added some subliminal Wall of Voodoo drum machine. I think it sounds great. Went to the gym. Did some errands. I adjusted a couple of other mixes and then some unexpected guests showed up, which more or less ended my day a bit prematurely. Good news is I am within sight of the finish line. Bad news is that even though I have 1 week left, none of the songs are finalized yet. There are some that are very close to done, but they all need tweaks ranging from minor (shaker down 1 dB!) to major (re-track all guitars and vocals, re-do drums). If you're like most product managers, you don't get to choose your team. You get whatever resources the company has available - engineers, QA, design, project management, and so on. Sometimes you get a team of great people. Sometimes you get so much deadwood and burn-out cases you're afraid a spark may ignite the whole bunch. You will almost certainly have fewer people than you'd like, and you may have fewer people than you need. But regardless, they are your team. They are the ones who will be doing most of the actual work of creating the product. Your job is to make sure they make the right product. And it's tricky, because without proper guidance and structure, your team is the enemy, and they will wreck your product. In many ways, Product Managers are like directors, and products are like films. The products have themes. The participants need to understand their motivation - why are they doing what they're doing? And the Product Manager needs to make it all happen. If you don't direct them, your team will wander, literally and metaphorically. Good products come from teams that know exactly what they're building and why. Teams need to know what's important about their product - what makes it worth building? They need to know the most important use cases (things users will do with the app) and invest development effort there. They need to know where the value in your product is coming from. Is designing a new kind of scroll bar a good time investment? (probably not, because it's not what's driving your product's value) How about a whizzy new database? (only if it's something your product relies on). Many teams wander because the individuals have their own agendas...because the product manager wasn't clear about what the team's agenda should be. Imagine a bunch of actors on a set. They all have particular goals and takes on their characters. They may even have different acting styles. In good movies, the director works to blend everything together and pull it in service of a common goal. Gratuitous, unnecessary, or inappropriate elements are cut. The same should be true with products. Once I worked on a software product intended for audio playback. The engineers had a very cool interface technology that allowed for some very ahead-of-its-time customization of the UI. We all thought it was neat, so we included it in the player. The code was solid, and it had minimal CPU impact...but it was a mistake. The feature did not drive the core value proposition of the app, and actively distracted users and the company from the app's true value proposition. The sales guys were showing off that part of the product because it was visual and different. People got excited and wanted enhancements. But improving that part of the product didn't help the business. It was a huge distraction. If you let your team drive the product, you may get a bunch of cool features and designs, but they won't cohere, and they may not drive your core value proposition. On a movie set, the director makes all the decisions. Right or wrong. In most of the successful rock bands, one person makes the final decisions. Same is true of the best product teams. And that person is the product manager. YOU are responsible for whether or not it's any good. Product management is not a democracy. Many people have opinions and perspectives, but only one person has responsibility. Some refer to the Product Manager as the "one neck to wring". The trade-off for that liability is "final cut" or final approval. Use it. If you don't, you are not likely to end up with a great product - one that has a vision, a theme, and some bold direction. You'll get oatmeal. A bunch of things that are OK. Or you might get a bunch of stuff in a box which sort of works. I believe the best design visions, the best products, the best art all come from single perspectives. They can be made richer via other input and may require other people to execute, but there should only be one "designer". That is not to say you should be dictatorial. You should strive to build a harmonious team. And you must listen to everyone with great care, and take their comments and concerns seriously. Build consensus where possible. The key words are "where possible." Despite best efforts, you are going to reach a point where your team disagrees. There are many ways to drive consensus ("Fist of Five" being a good one). Don't be afraid to make a call. Just make sure you have reasons for doing it, and make sure the team understands. Alienating your team is a fast-track to failure. You cannot succeed without them. Most of the time, you work with grown-ups. Even if they aren't in love with the project or your decisions, they will bring their "A-game" (or at least their B-game) every day and get stuff done. But sometimes you get stuck with a bad apple. This can be the person who simply doesn't pull their weight. It can be someone who undermines the team explicitly, by being a jerk to the team, being overly negative about the project, or who constantly argues with you about direction. This can also be someone who is talking to people in the company above you without your knowledge. These are small fires. If you don't put them out, they can grow quickly and result in product wreckage. It might be cancellation, reduced buy-in, or just demoralization. The first and best approach is to find out what's bothering the team member and see if you can mollify them. But do not be afraid to request their removal from the team. Often it's best just to get them out of the picture. Provide lots of low-latency feedback to your team. In other words, talk to them a lot, and talk to them as the project is in motion. Talk to all team members every work day. Not just to pester them about "are you done yet? ", but ask what obstacles they're encountering. What can you do to help them succeed? Know your team. If you want to understand your team, get to know them. Maybe your developer is slow this week because he's having personal problems. Eat lunch together. Buy your team lunch every now and then. Even if the company won't expense it, you can get everyone a sandwich somewhere for not that much money. It's hard to be a jerk to someone you had a sandwich with yesterday, and everyone likes the surprise of a literal free lunch. Plus it fosters communication. And I don't mean "bring in a pizza and keep working." I mean get OUT of the office, go sit down somewhere, and relax. Regular reviews. Periodically review the accomplishments. Praise hard work. Look for things causing problems. This is most important early in the project and at the conclusion of the project. This stuff may seem overly basic, but I am always surprised at how often people don't do one or more. Up next: YOU are the reason. More tweaks to "What The Wire Said". Lots of writing and thinking. A bit of experimentation around a new track with a kind of old English melody. Sounds a bit too cheesy right now, but I have a verse and a chorus. We'll see how that goes. I played some of the tracks in progress for James (the amazing photographer) and Iran. Feedback was generally good. Surprisingly strong responses to "What The Wire Said", which I was not expecting. And rather muted or tepid reactions to "The Empty Sky", which I think is rather good. I think "Sky" needs mix tightening and some palette changes. The melody and underlying structure are good. Just needs refurbishing. Still, that bit of feedback sort of knocked me off my game a bit. I had hoped to balance the moodier, slower tracks with some more upbeat stuff. Will anyone want to listen to 35 minutes of slow(cow)poke music? Will I want to make it? Will it be interesting? Today I extended "What The Wire Said". It's a bit too long now but the general shape is there. I added acoustic guitar in some nice ways and a tiny bit of JX-3P (gotta use that gear!). At 11 minutes(!) this might be the longest track I've recorded. I think it's sounding pretty good. With the 3 songs I have so far, this feels like about 15 or so minutes, which is really great progress for such a short time. Listened to the tracks some more, but aside from some notes scribbling and a brief bit of morning picking, the rest of the day was burned with work-related activities. Had to go in to work early today for meetings and had to go to a friend's birthday. Aside from some listening, no work on RPM today. Frustration and false starts. Being Saturday, I had hoped to get a whole track done and work out. I started on one track, but realized it was far too derivative of Wall of Voodoo. As in: it sounded exactly like Wall of Voodoo. There's a fine line between homage, influence, and derivative rip-off. I was on the wrong side of that line, but it took a long time to figure that out. I started on another track, but it felt very stiff and I couldn't get it to feel right. I pushed through sheer force of effort, but I kind of hate it. By the end of the day, my back was hurting and I was frustrated. I can't remember so many total wipe-outs on tracks in past RPM years, but maybe I'm just selectively remembering. Went to the gym and hoped for a better day tomorrow. Got off to a typically slow Sunday start today, but I was determined to finish a track. I went downstairs to the studio and started picking on the guitar. I rather quickly came up with a nice guitar pattern for a verse and chorus. I sketched out some words and a melody. I tried to focus on the emerging themes and vibe of the record and decided this needed to be the title track. This also forced me to lock in a title: "The Ghost Town". I struggled to lay down the acoustic guitar - I really am a poor acoustic player. Thank god for digital editing. I think it has a nice, loose vibe, though. I spent the next few hours building up the track, adding in some low synth rumble, melodica, fake lap steel, shaker and vocals. Lots of time spent experimenting with different acoustic samples and background ambiences. Finished the track shortly after dinner. I think it's a good one. Fought with Cubase. Couldn't get the metronome working in Cubase 5.52. Still got a skeleton track down. Many pages of notes about what to make this year. Also realized I didn't have the 1.0.2 version of ValhallaShimmer - important because 1.0.1 didn't support presets! Beginning track is the first idea that came into my head, currently just a verse/chorus outline. Cubase 6 arrives. Installed. Normally I would never upgrade software in the middle of a critical project, but these can be run side-by-side. Fortunately so far it is way better than 5.52. More guitars. Song stretched from initial ABCD structure to a more fleshed out IABCD_ABCDDDD type-thing. Started on lyrics. Feeling extremely tired again, so this is about as much as I can accomplish, other than working on some notes in the notebook. Lyrics for first song finished. Not much done today other than sharpening melodies on the commute - I have to be at work extra early (8 am) and will be staying extra late (leaving after 8 pm). TIRED. Vocals put down in early morning before going off to work. Can't do much else because of work and tickets to see The Church play 3 classic albums at a nice small venue. TIRED. On the motorcycle ride over to the show, I start singing some parts for other songs. Hope I remember them. First song is probably going to be around 4:30. Not a bad start. Pushed a bit further on track 1 (working title: "The Empty Sky"). Burned most of the day having a nice visit with a friend (plus two hours of driving and errands). After dinner I started a new track ("What The Wire Said"). I am intending for this to be a long epic, but I only have time and patience to sketch it out. Today after a typical late Sunday morning, I expanded on last night's track, building it up to about 5 minutes. I have a long punch list for both tracks so far, and need to keep making progress overall. Went out for a run and thought about another song. Wrote some words and a melody in my head. Got back and picked out some nice chords on guitar. The MOG app I designed and manage was recently chosen by TIME magazine as one of the "50 Best Apps of 2011". This puts my work on the same list as Brian Eno's! Coincidentally, MOG just released a very nice update to the App which went live on Monday. The TIME magazine citation joins the Billboard "Best Streaming App" award MOG won in 2010. It is quite satisfying to be recognized (albeit abstractly), especially considering some of my history in the business. Credit is due to the fantastic developers, visual designers, and quality assurance people at MOG. As one of my friends said, I have the easy part: the "dreaming-up" job. They're the ones who actually make it all happen. MOG has many more great things to add, and some exciting plans for the rest of the year. If you like music, it's worth checking out. Available for iPhone and Android.